Posted on August 17, 2011	by Lou Murray, Ph.D.
We just returned from a birding trip to Mammoth Lakes California. My husband Vic Leipzig led a group of birders in search of white-tailed ptarmigan, black-backed woodpeckers, and other mountain specialties. And found them! So my harvest this week was for only four days. The poundage wasn’t spectacular, but the variety was good. I’ve been lagging in photographing my harvest, so here are some catch-up photos of some of my late season harvests as well as this week’s. 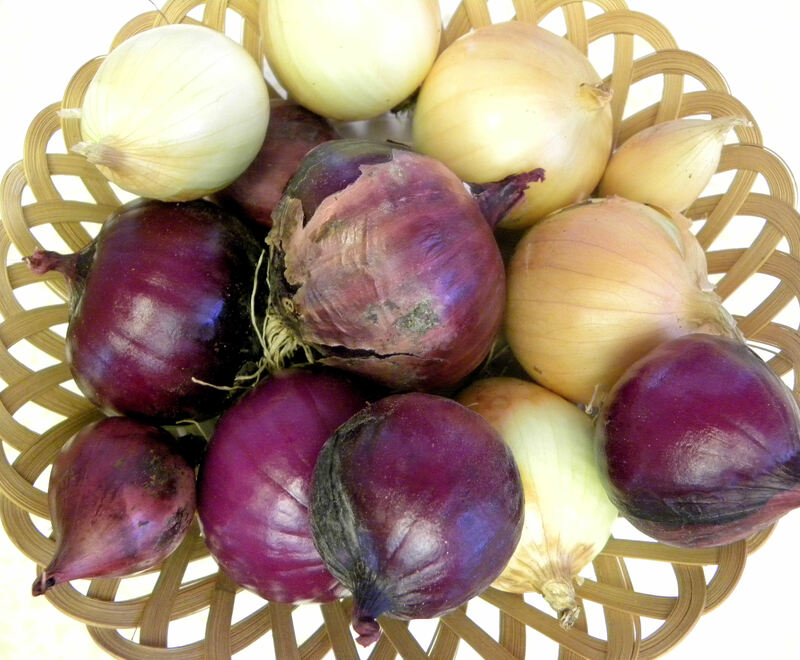 My community garden plot provided some really nice onions this year. Here are Texas Sweets and Southern Belles. Both are incredibly sweet and mild, really nice onions. 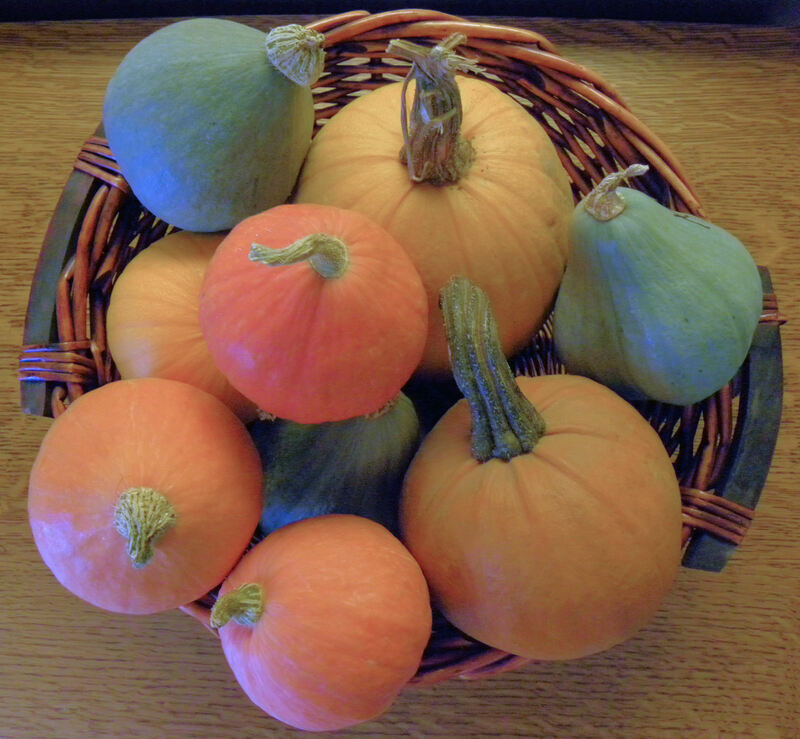 I grew a nice variety of winter squash and pie pumpkins too. Here are some of them: New England pie pumpkin, Amish pie pumpkin, mini blue hubbard, and mini red kuri. 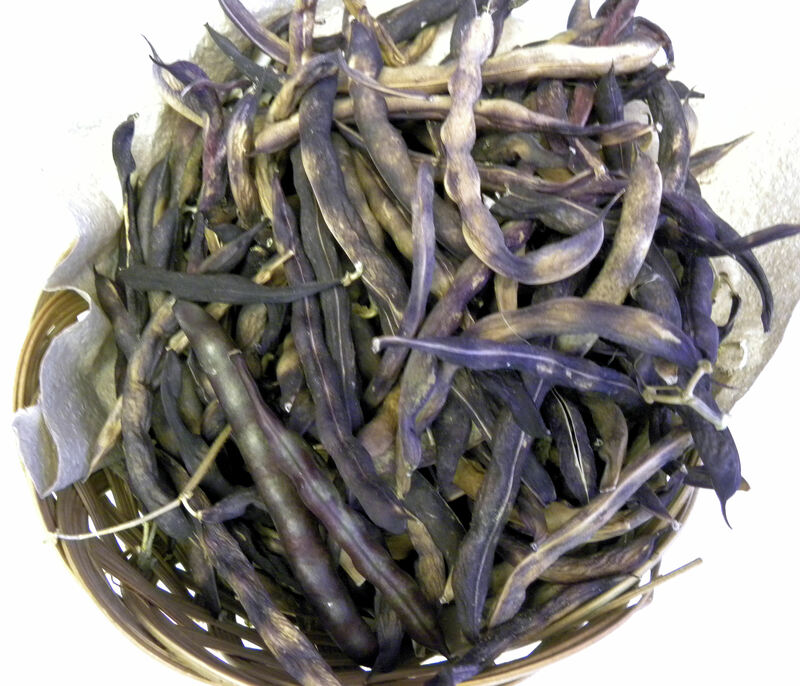 These Cherokee Trail of Tears pods will provide dried black beans for soup later in the fall. 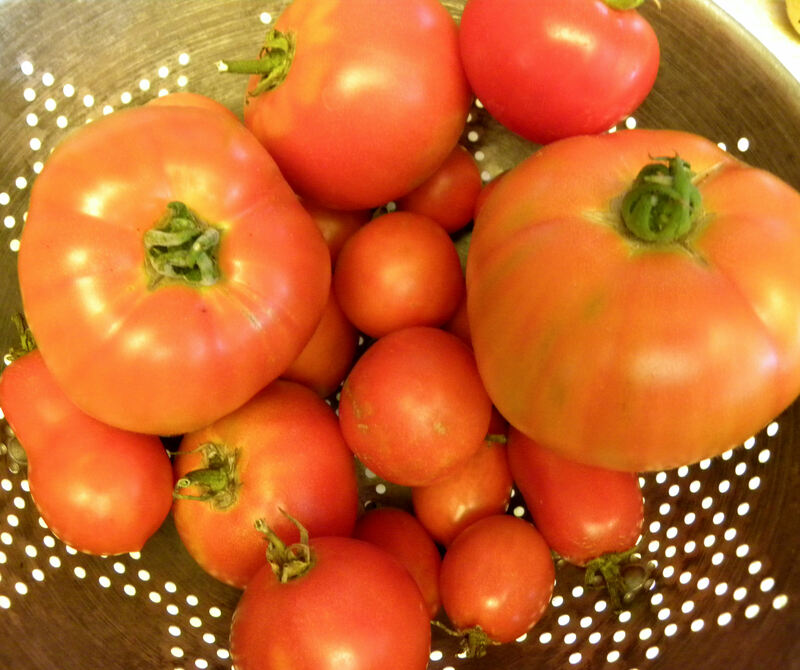 My tomato harvest at both my home garden and the community garden is really falling off. Harvest of tomatoes should be extending well into October and even November, but my plants at the community garden are nearly dead already. I'm trying to revive them with additional fertilizer and compost and some pH adjustment of the soil, which is too alkaline. They're responding, so I have some hope of getting a few more tomatoes later on in the season. 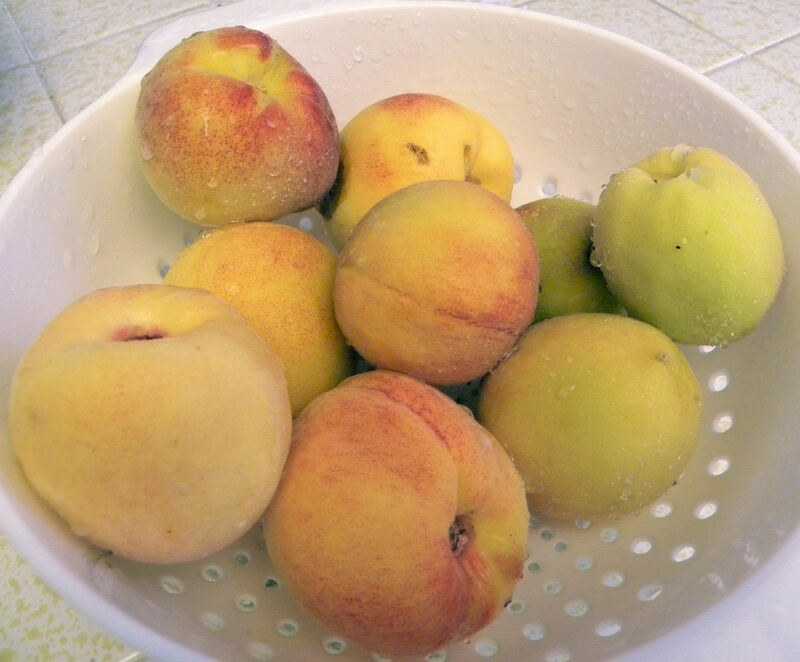 I didn't get too many peaches from the neighbor's tree this year. The rats got most of them. 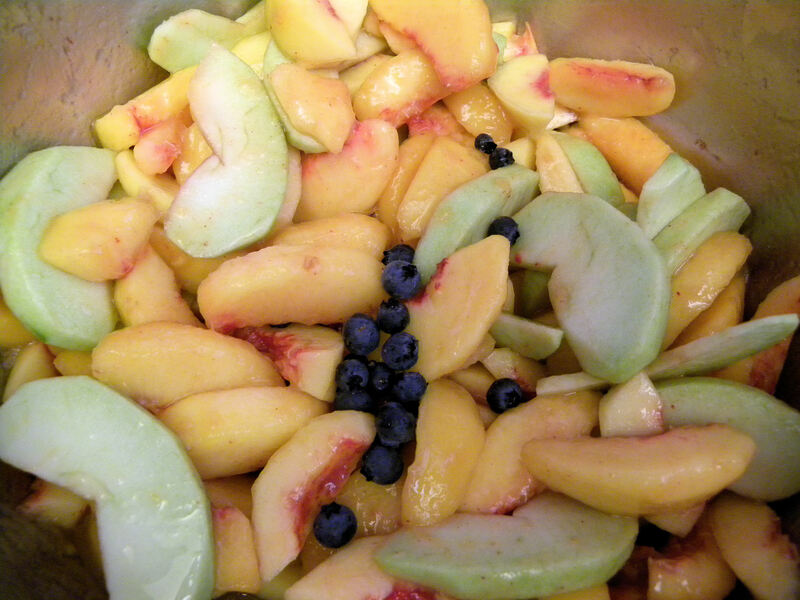 The peaches went into a pie along with a Granny Smith apple that an opossum knocked off the tree and the last little drab of blueberries. Here the fruit is in a bowl. I was going to photograph each stage, but forgot. And when the crumb-topped pie came out of the oven, it smelled so heavenly that we gobbled it up. Sorry, no photos of the pie. Trust me, it was beautiful. 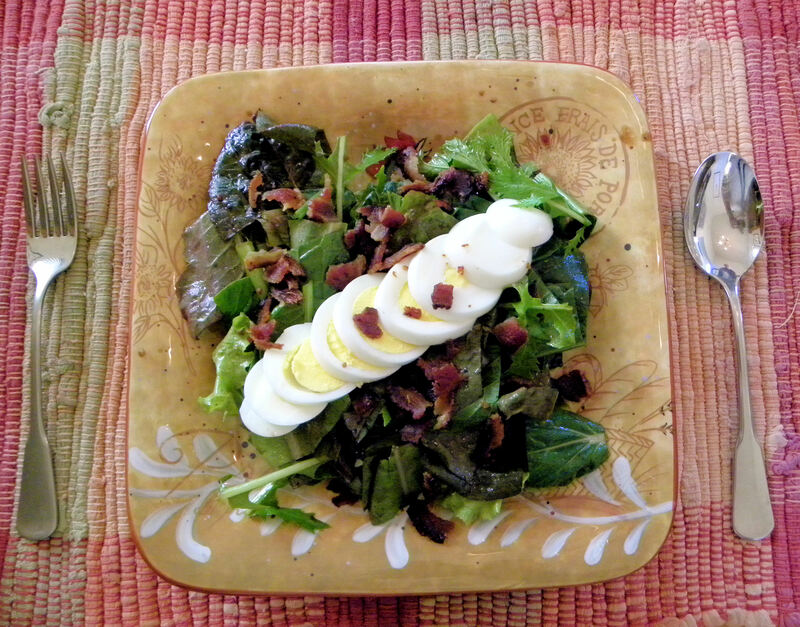 The mesclun went into a salad with hot bacon grease-basalmic vinegar dressing with a boiled egg. Delicious! Can't believe I'm harvesting mesclun in August. 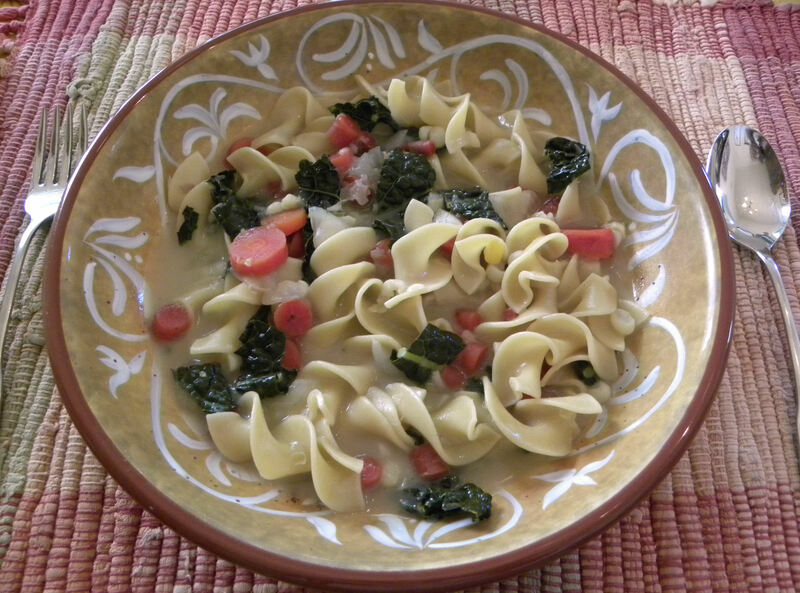 Carrots, onions and lacinato kale went into a chicken broth. Then I added egg noodles. If you haven't grown Lacinato kale before, give it a try. It has a much milder taste than Scotch blue curled and a finer texture. I'm hooked on it, but will continue to grow the Scotch blue curled as well. This is essentially an Italian stir-fry. 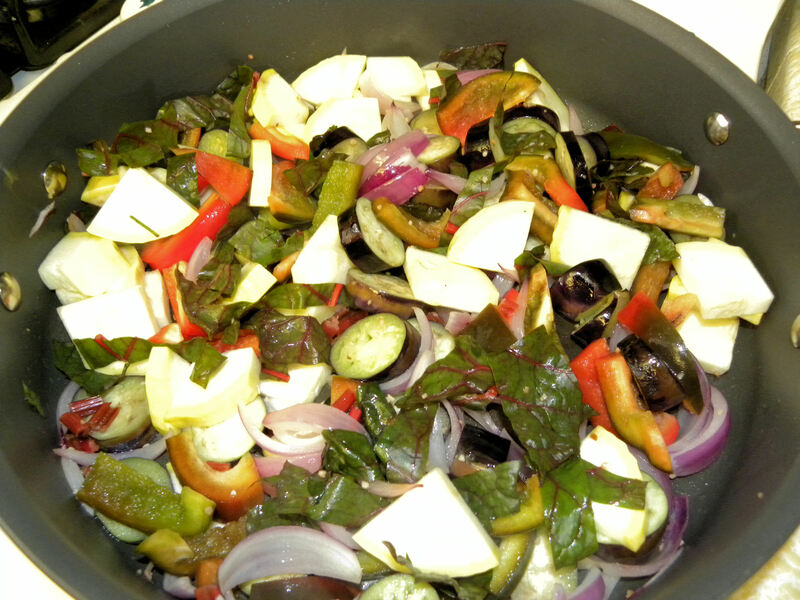 Onions, garlic, eggplant, bell peppers, summer squash, and chard, all stir-fried in olive oil. Then I added some marinara sauce and some cooked pasta. Didn't get a photo of the finished product. Ate it too fast. Delicious! Here is my harvest for the week ending August 14, 2011. Everyone else has already posted their harvests on Monday at Daphne’s Dandelions. I’m late, as usual. Happy gardening. This entry was posted in Uncategorized and tagged Cherokee Trail of Tears beans, Harvest Monday, Lacinato kale, mini Blue Hubbard squash, onions, photos, pie pumpkins, Red Kuri squash, Scotch blue curled kale, vegetable garden. Bookmark the permalink. Your pumpkins are looking good! We’ve harvested a few ‘Baby Pam’ pie pumpkins, but not much else yet. I’m hopeful for our Red Kuri, and Anna Schwartz Hubbards. We’re waiting to see what the voles leave us though, they’ve been hard on the squash patch this year, despite trapping. It looks like ‘Boston Marrow’ may be our star winter squash this season, if only for their sheer size…but I don’t want to count my pumpkins before they’re harvested so to speak! Clare, I wondered if others on the California coast were having a cool summer, and it looks like you are. We had blazing heat in early June, then cool when it was supposed to be warm. Global weirding. With all your space at Curbstone, you should be getting a great winter squash harvest.